While there is no doubt that the Turkish Airlines lounge in Istanbul is excellent, but after two visits there, I’m am not as impressed as I hoped or expected to be. The experiences I had did not match the hype. The lounge design is beautiful, Mike was more fortunate than me for it not to be packed. Both times on the two separate days I visited it was terribly crowded. Despite very tasty fresh food being prepared, it is often difficult for staff to keep up and have all items available. They were making freshly baked pizzas, and this choice was so popular, despite waiting in line, by the time I got to the front of the line there was nothing available until the next batch was completed. There were also freshly grilled meats being prepared, I was able to partake in this, and it was excellent. Not being much of a coffee drinker, I enjoyed the various tea options as well. This lounge has already been reviewed extensively on this site. (Photo credit to Mike for several of these lounge views). I don’t dispute that this is a great place, and absolutely worth a visit on Istanbul layovers, but it was simply too crowded to relax and enjoy when I was there. Later in my visit, after walking around a bit, I noticed that there weren’t even any open seats that I could find. Even when I arrived around 6AM on my way to Manchester, I wanted to try out the shower rooms, but I was told it would be a 3 hour wait. I put my name in, just in case, but I never made it to the top of the list before I had to depart the lounge and head to my gate. On my second visit before I was flying back to the US, I barely had time to even visit the lounge due to extensive delays in getting checked in and through security. Granted, I didn’t give myself that much extra time since I was trying to maximize my time exploring Istanbul before my flight. There was an even longer wait to get through security and to passport control. Even though I was using the premium security line since I was in business class, it was slow, with lots of people cutting the line before we even got to the main stanchions of the security lines. I realize I’ve been spoiled with PreCheck lines in the US, but this was really bad. 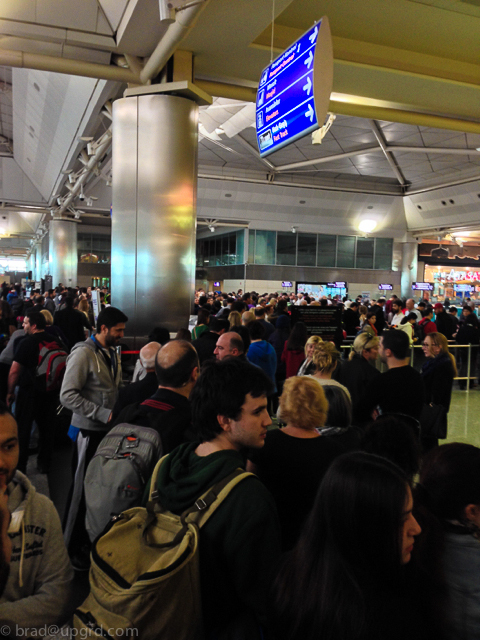 It took over an hour from the time I arrived at the airport to get through passport control. Many more people were in the ‘standard’ line, and I don’t want to think about how long that took. The overcrowding in the airport and especially in the lounge certainly curtailed my experience. Thankfully, this lounge has recently been significantly expanded, so I’m hopeful it should help. That said, the airport is still growing very quickly, so the long waits to check in and clear security will likely continue. There are many good things with this lounge, the food and beverage selection is expansive. The shower rooms are supposedly nice. There was just too many people for me to be able to relax and enjoy my time before flights. Is my review too harsh? What did you like best about this lounge? Has anyone visited since the new expansion is open? I hope its a little more relaxing now!